Unless you're the Denver Broncos...or this past year's St. Louis LA Rams. I like the jerseys, but I hate the helmet. The green is going to constantly mismatch with the jerseys and they will always be a white helmet team to me even when they dabble in green. Also having a green helmet allows them to have a black uniform, which I don't like. Broncos were over 5 years old and the Rams knew they didn't want to wear the new uniforms until they entered their new stadium. The Jets will probably still wear that black uniform 3 times a year if the NFL continues to enforce Color Rush. Well the outrage machine here going into full blast mode was predictable no matter what was released. These look pretty tame, I’m not even sure where the shouting about these looking too modern and trendy is coming from. If anything they are a bit plain. The shade of green is really quite nice and I’m interested in seeing these helmets under the sun and lights, I think they are pretty attractive. I get the “they don’t match the green in the Uniform” but I’ll reserve judgement until we see them in action. Helmets are not fabric there’s no universal law that says they have to look exactly the same (in fact if you want to be a purist to materiality - they shouldn’t look or react to light exactly the same as fabric). They just shouldn’t look out of place, they should just complete an identity. The monochrome and BFBS looks are the worst of the set but that’s this era for you. I think these are gonna look sharp in green/white and white/green. Upon further review of the Jets jerseys, I am willing to concede to some of @Ice_Cap and et al. 's point about looking like the Roughriders because of the pants (though I am a bit irked as to why my post needed to be responded too, despite said response happening after the original Jets thread was locked, but that's neither here nor there). I will still contend the similarities mostly stem from the fact there's only so many ways similar shades of green can look on a football team. Wrong. 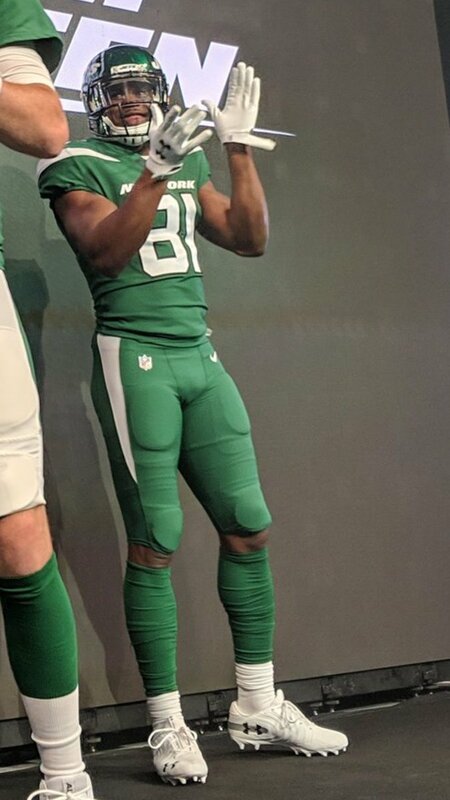 The new Jets uni is clearly a blatant rip-off of the Farmingdale High School football team of Long Island, NY. Shame on the Jets for stealing these kids' uniforms. Sad. I really love the idea of this set. The new green is great, the return to green helmets is welcomed. Yes, the uniforms are a bit plain, but that's also something I welcome. I just don't like the logo. This set's screaming to have the old '80s-'90s Jets logo return to the helmet. It seems like such a no-brainer. The Rams had to get special permission about a throwback...and Denver had to put in a request two years in advance to change from the blues to the orange primary. Underwhelming. It really looks like a lazy design attempt. The coolest thing is the sleeve stripe and they couldn't even figure out a way to wrap it around the back and just cut it off at the seam in the panels. Meh. At least we'll never have to see these in a Super Bowl. I'm like 90-95% in agreement with this. I don't have any issue with the black facemask (though you're right that white would've popped more), or the black alt (though you're right that it isn't altogether necessary, and I think it's the weakest-looking of the three jerseys even if you don't look at it as BFBS). I would have loved to see the return of the Concorde, but the wings on the shoulder look cool. Wish they wrapped around for a contrast-color nameplate, though. I have no strong opinion on the chest text. I actually like that the city name is spelled out somewhere in the uniform. I think having the triangle under the team name on the helmet would catch the eye more than just having the shape of a football does, but the helmet itself is awesome, and the logo is decent. Interestingly, I agree with you on the lighter shade of green being better for the pants. I think it was when they started wearing those dark green pants that I began to realize I missed their Kelly green look. The more I look at it the more I like the logo on the helmet. The football is redundant and since "Jets" must be on their helmet no questions asked, that triangle below it would've been nice. I do like the size of that logo and the equality in font size of each letter, which they didn't have in the past. It kind of blasts the viewer, and I think it'll do that on tv. For me the test will be how I feel about it the first time they stop New England on a 3rd-and-9, accept a penalty to push them out of field goal range, and then give up a touchdown on the next snap. If I still like the logo after that, it's a keeper. I think this is the inevitable result of merchandising culture. Once "will it sell?" becomes the primary concern, good designs become harder and harder to create. Very true. What baffles me most is the prevailing opinion that good design doesn’t sell. Marketers and designers like to think that it’s the story and the look that sell, but team success has a much greater impact on sales figures than anyone wants to admit (because admitting it devalues marketing and design). Also, how about that contrast stitching all over the jersey wedge, guys?! I don't think there's anything I hate more on football uniforms than "shards". The Broncos redesign of the 90's spawned a puke-worthy decade or more of knock-off designs. It was atrocious then, it's atrocious now, and I simply can't believe these actually happened. If they had simply done a full contrast panel down the leg, or kept the 3-stripe look, and just copied that look to the sleeve cap, these would be an A+ uniform. Instead, someone had to be cute, and we got this trainwreck to look at for at least 5 years. It's unfathomable to me that the NFL, partnered with Nike, allows the Falcons & Cardinals to keep their current designs, and that they allowed this Jets uniform happen. This, coming from a diehard Nike loyalist. The previous set was 100x better. This is the Browns redesign all over again. They look like they have a rivalry with the Gotham Rogues. Also, the sans-serif ‘1’ looks awful paired with the rest of the numerals. The Bears are the only team that can pull it off. Wrong. The new Jets uni is clearly a blatant rip-off of the Farmdale High School football team of Long Island, NY. The difference being that the “contrast stitching” is a result of 2 or more different color panels coming to each other. It’s not an intentional design element. Now the browns contrast stitching is an intentional design element because it exists on every seam of the jersey. The disappointing part is that the Jets used to have a classic look. This, in my opinion, is a downgrade from classic to Madden build-a-team generic uniforms. They're not really ugly, they just don't strike me as any of the things that can be enjoyed in a football uniform. They're not classic. They're not unique. They're not trendsetting. They're just generic. I do think the logo change is a positive development, though. Does the decal have a solid (rather than clear) outline like the Denver Broncos decal?